Protecting your wheels makes common sense really, but a good quality, high-performance wheel bag is an essential purchase whether or not you transport your bike with the wheels removed, or use different wheelsets depending on the course or weather conditions. Like all of our well-respected own brand goods, Planet X wheel bags offer more bang-for-buck than any other bags on the market today. No-nonsense and truly practical bit of kit designed to safeguard your investment for years to come. Whether you take different sets of whels for different race day conditions or just need a quality, padded, double wheel bag for foreign holidays or even just for storage at home the new Planet X padded wheelbag fits the bill. 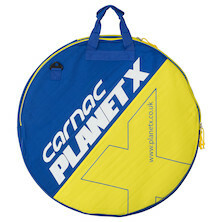 Whether you take different sets of wheels for different race day conditions or just need a quality, padded, double wheel bag for foreign holidays or even just for storage at home the new Planet X padded wheelbag fits the bill. 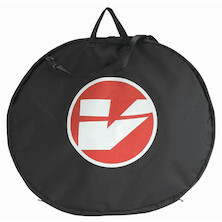 Double padded wheel bag from Vision, FSA's speciality wheelbuilding division.